June 7, 2017 - (GRAPHIC CONTENT) In front of onlookers, a live donkey is thrown and fed to tigers at the Yancheng Safari Park in Changzhou, Jiangsu Province, China. The facility is facing financial difficulties and angry investors threw the donkey into the enclosure to reportedly save costs on feeding the tigers. It took the captive tigers almost a half hour to subdue and kill the donkey. 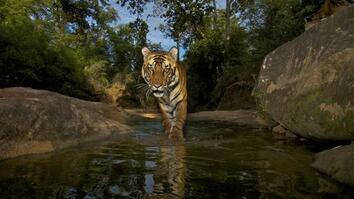 In a natural setting, wild tigers would kill prey by clamping on its neck to suffocate it within a few minutes. 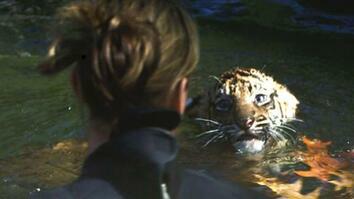 Read "Live Donkey Fed to Tigers at Chinese Zoo." A disturbing incident took place at Yancheng Safari Park in Changzhou, Jiangsu Province, China: a live donkey was thrown into a tiger enclosure. This was not a routine feeding … since the donkey was also a zoo animal. This was orchestrated by investors angry about a business dispute that led to the freezing of the zoo’s assets. They wanted to sell the animals but were blocked by the zoo staff. So the investors threw the donkey in the enclosure to reportedly save costs on feeding the tigers. The captive tigers pounced but struggled to subdue the donkey. 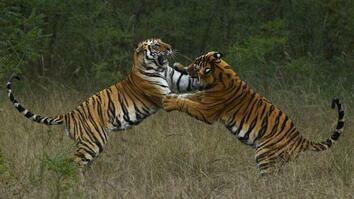 In a natural setting, wild tigers would kill prey by clamping on its neck to suffocate it within a few minutes. However, it was reported the tigers took almost a half hour to kill the donkey.